Are you in the market to purchase a mind mapping software but struggling to figure out which tool is the right one for you? Is the best option online, desktop or just an app for your smart phone? Is it worth while paying for a professional mind mapping tool as opposed to downloading a free online tool? In this review, our team will evaluate the best professional desktop mind mapping software to see which is most useful and if it's worth your money to invest. In this evaluation, we have chosen to evaluate MindGenius, MindManager and MindView. Let's start with the basics, how easy is it to make a mind map because if you can't use the software its worthless, right? 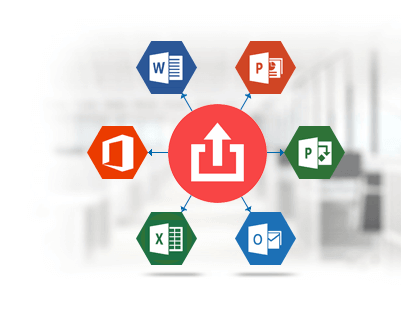 All three desktop applications felt easy to understand and use right away because they all adopt the Microsoft Office interface. Further, you are able to use familiar keyboard shortcuts, so the learning curve was dramatically decreased. This seems very different to online tools where you have to find your whereabouts, learning a new interface, before getting started. 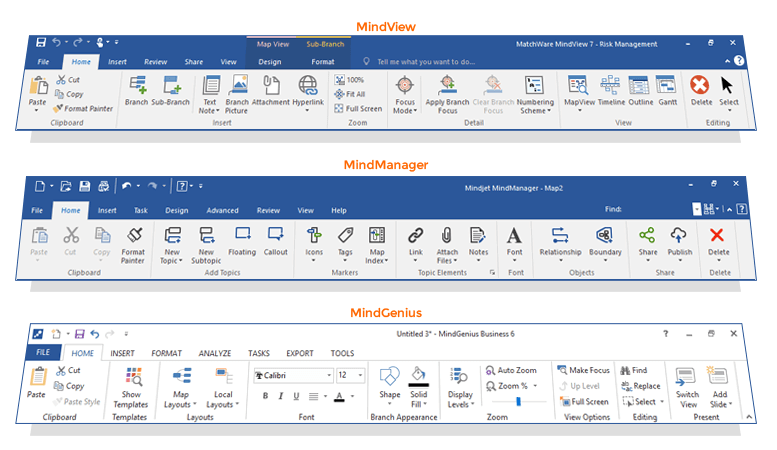 MindManager and MindView seem to have implemented and updated the Microsoft Ribbon system (menu structure) and Backstage particular well, whereas MindGenius is beginning to look a bit outdated. MindGenius is like using your dial-up AOL account to download a photo album...the millennials won't understand that reference but it's accurate. Mind Mapping software can have an over-abundant amount of features in their interface which may be rather overwhelming for beginners. In the software world this is called "bloatware". MindView's simplified user interface is the first tool we have encountered that tries to solve this conundrum. We agree, I think they may have done it! Let's explore the differences a little further. For example, attaching files was intuitive in MindView, and unlike other mind mapping software lets you attach an unlimited amount of files since MindView links files by default; don't worry MindView also allows you to embed the files. Here is the section for all you die-hard Mind Mapping theorists (everyone else is starting to yawn). Stay awake, we will make this section brief. In all three applications, you have the ability to add images and colors to your mind map...blah blah blah...mind mapping theory states something about memory retention. Our interns did the research and the theory is correct, trust us (wink wink). Also, all three software tools enable you to add easily images, icons and colors to branches. However, not all of us think non-linearly like a mind map. Some of you prefer to consume data in a linear layout. This leads us to the various ways you can communicate the data in an outline, timeline or Gantt view. Spoiler Alert: we will discuss the Gantt and timeline layout later. Finally, let's talk about customizing the mind map? There are plenty of ways to customize the maps in all 3 programs, and all 3 programs are basically the same. Let's move on to something more interesting…something that really separates the pack…the MS Office integration. The free tools and the online tools just don't have the moxie to stand with the desktop applications in this category. It's really about the transfer of data and not having to re-create the information that makes the desktop applications more of a productivity tool than anything else. What separates the desktop applications in this category? All 3 tools export to MS Office, but all 3 tools have varying degrees of sophistication. An honorable mention in this section is definitely MindManager. MindManager's exports were much better and more "polished" than MindGenius. Also, compared to all 3, they made it much easier to make custom templates to suit a company's brand. MindView has the edge in this category for 2 reasons. The first, the pure speed of the export, MindView is template-driven so there is no fuss to the export and the final product is "turn in" ready. The second, MindView "goes both ways" when importing and exporting to MS Office. MindView is more of a productivity tool which allows us minimal effort with maximum results. This is another category where the online and app options can't compete. The online tools aren't mature enough, and the apps can't handle the size of the data. As a result, when referring to mind mapping and project management, size does matter. For the beginner project manager who needs an easy-to-use tool to replace the "white board" exercise and move that data to a Gantt chart, take your pick. All 3 programs can make that happen. We actually liked the ease of use of MindGenius over MindManager. The one feature that MindManager had which no one else has achieved is the "split screen" when working on a project. Basically, you can view your mind map and Gantt chart at the same time. We felt this was very valuable when presenting the data to individuals outside of the "project" world, such as stakeholders or upper management. They could easily make the connection between the Gantt chart and what was actually planned. Once again, we feel MindView has edged out its competition in this category too. 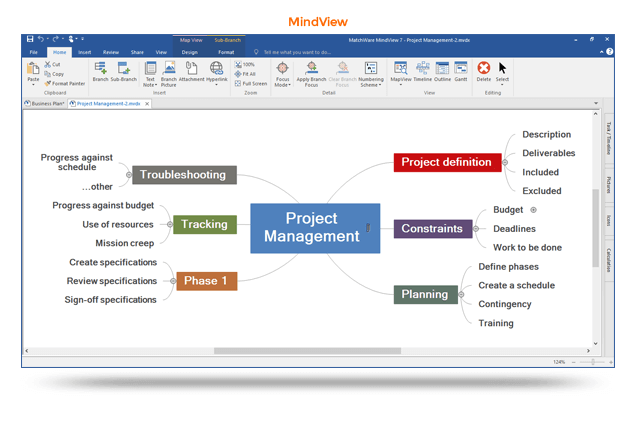 If you're a PMP or need an alternative to MS Project your only choice is MindView. MindView even surprised our project managers on the level of sophistication it had in the Gantt chart. MindView gave you the ability to select effort-driven tasks, resource calendars and multiple baselines just to name a few. If you know what I was referring to in that last sentence…excellent. We will see you at the next WBS war room. If you didn't, stick with MindGenius or MindManager as a lighter alternative. In conclusion, do we have a clear winner? In just making a mind map…maybe not…we think all 3 are healthy options over the alternatives (online, app and free software). There is something we discovered while moving down this road less traveled. It's not just about making the mind map. It's more about what you do after you make the mind map. How do you share the data and how do you manipulate the data without recreating it. In a world of constant throttle and high powered energy drinks…it's all about productivity and time savings. As a result, MindView is not just making a mind mapping tool but more of an overall productivity tool. As our friend Jack Kerouac once said, "Great things are not accomplished by those who yield to trends and fads and popular opinion." We feel this refers to MindView, we think they are starting to "break the mould" in the mind mapping software world.